Altec Lansing inMotion iM9 portable speaker audio and sound system features dual 2 3/4-inch drivers with 1-inch tweeters, and MaxxBass technology. A built-in handle improves portability and has the ability to power the device via AC or batteries. 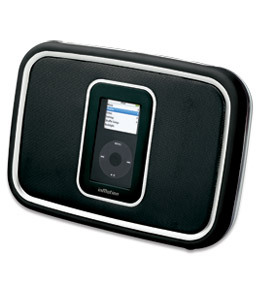 The inMotion iM9 works with and able to charge all dockable Apple iPods (with dock connector) include iPod nano, iPod mini and color iPods. Beside, an Auxiliary input allows users to plug in other audio devices, such as CD players or portable DVD players. Playlist likes the portable speaker for its impressive sound quality and volume levels for the size, durable design, secure iPod storage, provides ports for audio, video, and data, and includes handy backpack for travel. However, it’s a pity that there is no remote, volume buttons difficult to press, volume very loud on turn-on, no protection for front of iPod and it’s heavier than most portable systems.